The GefenTV Repeater for HDMI 1.3 can greatly extend the reach of HDMI signals with exceptional flexibility and value -- in two ways. In its basic configuration, the Repeater for HDMI 1.3 links two HDMI copper cables together to create a longer extension, as easily as connecting two cables -- up to 100 feet. 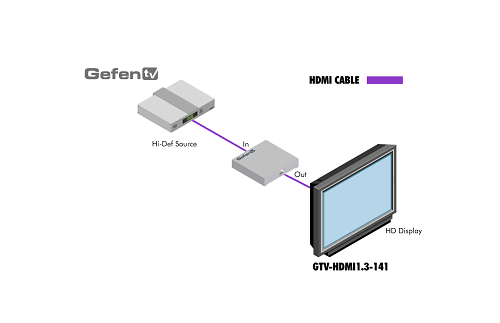 Alternately, GefenTV Repeaters for HDMI 1.3 can be combined multiple units deep, or "daisy chained," to create much longer HDMI extensions -- up to 360 feet. With the GefenTV Repeater for HDMI 1.3, a world of creative HDMI extension solutions is yours, at a very reasonable price compared to other extension methods. The GefenTV Repeater for HDMI 1.3 supports both legacy HDMI version 1.2 features and the HDMI version 1.3 features such as Deep Color, 1080p HD resolution and 8-channel digital audio for the best entertainment experience. User Application: Extend HDMI up to 360 feet. A copper HDMI cable -- up to 50 feet long -- is connected from an HDMI source (DVD player, set-top box, gaming console) to the HDMI input jack on the GefenTV Repeater for HDMI 1.3. A second HDMI cable runs from the GefenTV Repeater for HDMI 1.3's output jack to the HDTV display -- up to 50 feet away. The 5V DC power supply is plugged into a nearby wall socket and into the Repeater unit. A vibrant, pristine HDMI picture emerges on the HDTV display. The GefenTV Repeater for HDMI 1.3 may extend an HDMI signal even farther, up to 360 feet, by cascading or "daisy chaining" sets of Repeaters and HDMI cables up to 4 units deep. All GefenTV Repeaters for HDMI 1.3 in such a network must be powered to obtain a correctly functioning extension.